Dealer believes this is the only Turbo S in such a bluetiful color combination. The value of air-cooled Porsche 911s continues to be in the stratosphere, particularly the final models belonging to the 993 generation. 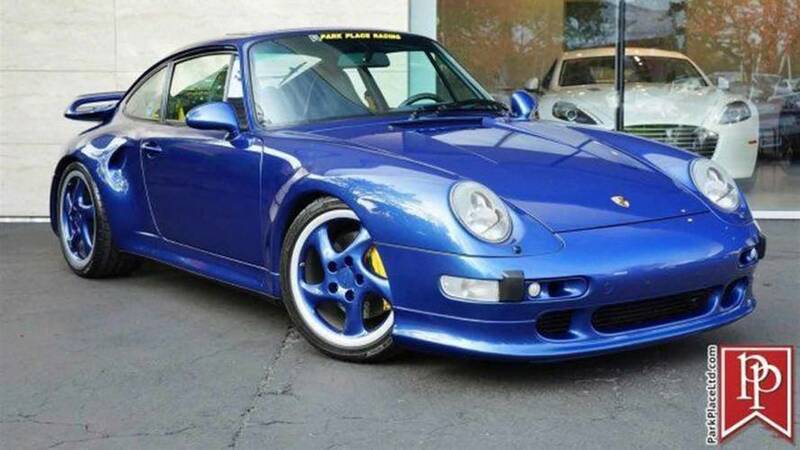 A dealer in Bellevue, Washington, now offers the chance to offer one the the top variants of these coveted cars – a 1997 Turbo S. It carries a $695,000 asking price. The Porsche Exclusive customization division handled construction of these limited-run cars. It built just 345 examples for worldwide consumption and only 182 came to the United States. The dealer believes that this one is unique because of its color combination of a Cobalt Blue Metallic exterior and a Metropolitan Blue leather interior. Where the standard 993-generation Turbo had 402 hp (300 kilowatts) from a 3.6-liter biturbo flat-six, the Turbo S featured larger turbos and engine software tweaks to push the output to 424 hp (316 kW) for models in the United States and 450 hp (336 kW) in Europe. The seller of this one mentions it producing 450 hp, suggesting possible tweaks to bring the powerplant to European specs. All examples of the Turbo S featured a six-speed manual that routed to an all-wheel-drive system. Porsche Exclusive gave these cars a motorsport-inspired look, too. The most noticeable change is the widebody rear with vents in each fender. There's also a revised front fascia with additional inlets and an extra element at the rear that creates a two-tiered spoiler. As opposed single exhaust outlet at the corners of the bumper from the regular Turbo, the Turbo S featured dual pipes exiting from each side. Inside, Porsche Exclusive gave occupants quite a comfy cabin. The original buyer of this one made things even more opulent by specifying a full-leather interior so that hides covered areas like the the headliner, sun visors, center console, and tray behind the parking brake. After just over 20 years, this 911 Turbo S has only covered 17,917 miles and only had one owner. It comes with the original window sticker, a Porsche certificate of authenticity, service records dating back to the original purchase. MotorGT is part of Motorsport Network, parent company of Motor1.com. A high-end marketplace where the rarest, fastest, and coolest cars are sold, MotorGT searches the world for the best exotics, hypercars, super cars, classics, and race cars. If you have the means, we highly recommend picking one up.